Choose the coastal route on your way into the Upper Peninsula of Michigan, and you’ll enjoy some nice scenery along the shores of Lake Michigan (occasional glimpses of the water, but mostly a lot of trees). 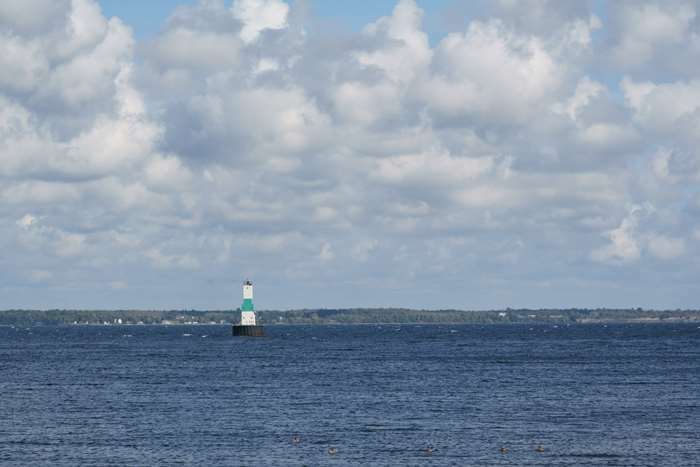 There isn’t much in the way of development until you reach Escanaba, where you can check out an interesting downtown, as well as the picturesque Sand Point Lighthouse. Escanaba is located along Michigan 35 at the junction with US 2/41 (the two run concurrently at this spot). If you’re coming from Green Bay, you’ll drive up US 41 to Marinette and Menominee, then you can choose to go inland with US 41 or hug the coast on M-35. Either way, you’ll reach Escanaba. In retrospect, maybe I should have taken the inland route. It was early October, but the leaves weren’t changing yet along the coast. I might have seen more fall color if I had stuck with US 41. The Sand Point Lighthouse is in an unexpected place, near the water to its left and right, but there’s a good bit of land behind it. That land wasn’t there when the lighthouse went into service in 1868. But eventually, Sand Point was expanded out into Little Bay de Noc. It’s now home to the town’s water plant. The lighthouse had nine keepers over the years, including one female lighthouse keeper. It was in service until 1939. The lighthouse is open to the public from Memorial Day until the end of September (9-5 during the summer, 1-4 during September). Look out into the water and you’ll see a green and white buoy, not far offshore. This buoy marks the wreckage of the Nahant, a steamer that went down in shallow water in 1900. The wreckage is now a popular dive site. From the waterfront, it’s just a few blocks into downtown Escanaba on Ludington Street. Ludington, you’ll soon notice, is a popular name in these parts. It comes from Nelson Ludington, a lumber baron and banker who did business here in the early days. 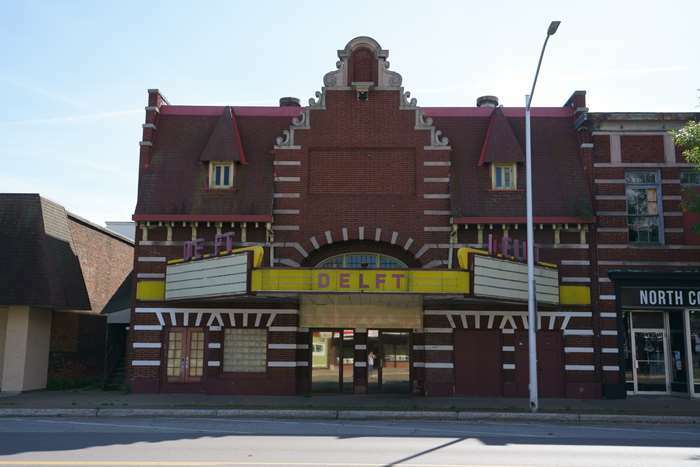 Once on the main stretch, you’ll see the distinctive Delft Theater, which opened in 1914. 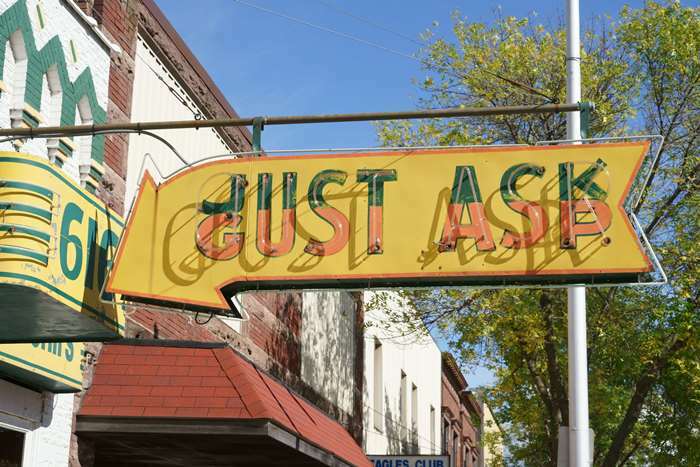 Gust Asp has another interesting storefront, that includes lots of neon — most notably, this hanging arrow sign that alternates between “Just Ask” and “Gust Asp”. I’m not sure what kind of questions you should be asking, but the store appears to sell mostly liquor and cigarettes. I’m going to go ahead and declare the cylindrical Harbor Tower Apartments building as the ugliest building in town. 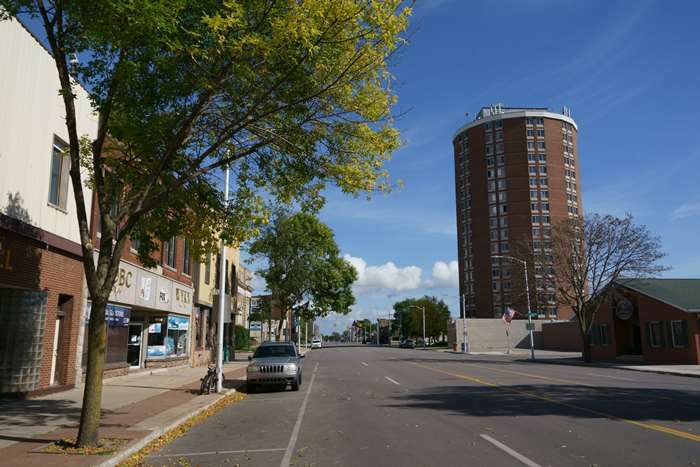 It looms over downtown Escanaba in a menacing fashion, and no doubt plagues its residents with unusable wall space. A much classier building is nearby. The House of Ludington was built in 1883 and expanded in 1910. 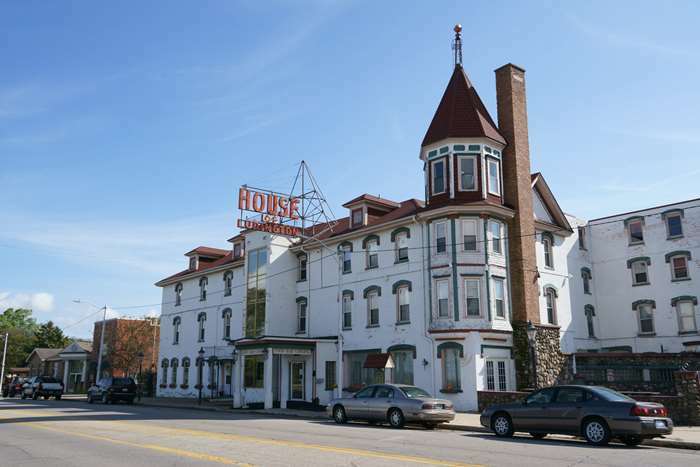 It still serves as a hotel and dining destination, and it has a fantastic neon sign hanging over Ludington Street. From Escanaba, I headed on to my destination for the night, Marquette, by way of M-35, which promised to be a more scenic route with excellent fall colors. I think I was about a week early for the leaf peeping peak, though, since it was a mostly uneventful drive up into Marquette. 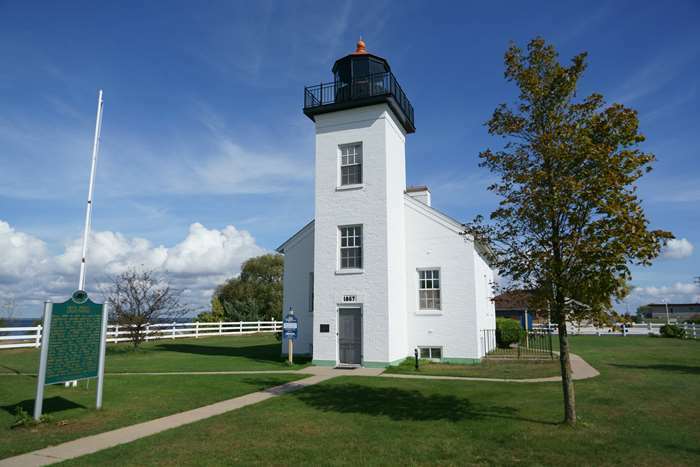 Escanaba is worth at least a brief stop, especially if the Sand Point Lighthouse is open during your visit. Downtown Escanaba is also interesting, but not essential to visit. You’ll face a long drive with a lot of trees on either side of Escanaba, so it provides a nice place to take a break from traveling.